GRACELAND begins!! The USA Network airs their new drama, GRACELAND, with its premiere episode tonight. The show tells the stories of some top secret undercover agents and the lies they’re forced to live with each and every day. Hey – that sounds just like our politicians! If you missed it we are running a giveaway for a great Graceland-inspired prize pack, if you have not entered, CLICK HERE. The new show features an all star cast including Aaron Tveit, Daniel Sunjata, Vanessa Ferlito, Brandon Jay McLaren, Serinda Swan and Manny Montana. “Graceland” delves into the lives of an elusive group of undercover agents from the Federal Bureau of Investigation (FBI), the Drug Enforcement Agency (DEA) and U.S. Customs, whose worlds collide at a repossessed Southern California beachfront mansion called Graceland (the house got its name when the authorities seized the house from a drug lord known to be an obsessed Elvis Presley fan). With three agencies living under one roof, ordinary roommate issues are amplified, as secrets are a matter of life or death. On tonight’s show FBI rookie Mike Warren is assigned to Graceland, a beachfront mansion where agents from multiple law-enforcement groups work and live. Mike learns the ropes with help from star agent Paul Briggs, who has a unique philosophy on the job and is fiercely protective of Graceland. 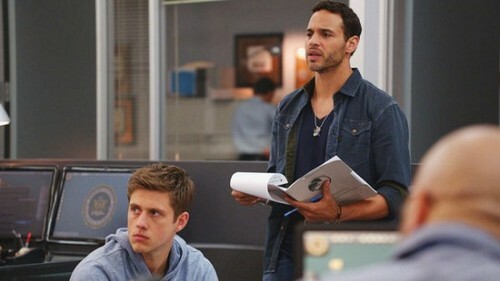 I cannot wait for tonight’s premiere of Graceland it looks like it is going to be a great show. The show airs tonight on USA Network at 10PM EST and we will be covering it with all the details. So make sure to bookmark this spot, and come back for our live coverage of Graceland Season 1 premiere right here. Enjoy the show folks! RECAP: On their Graduation day, several agents including Mike Warren get their pep talk from one of the speakers. As they are getting inspired across town a drug deal is going down. At least it’s supposed to look like a deal but in actuality it was an undercover agent who, due to a small ball, is caught out and shot. Back at Graceland house, Paul Briggs is woken up by his boss. The agent that was shot is being replaced. The other agents in the house hate the idea and only grudgingly accept the new guy upcoming arrival. On the plane, Mike is learning Spanish when he begins chatting with the older Spanish lady sitting next to him. He tells her he’s a teacher but then the stewardess comes right up and announces he’s a special agent from the FBI. She did this because she has special orders for him to wait at baggage claim. Awkward. One of the agents, Johnny, picks him up before taking him to see the sights. They make it to the house, Graceland. It was named that because the previous owner, a notorious drug dealer, was a big Elvis fan. Each agent has an undercover so the neighbors don’t know about their profession. Mike does runs into some trouble with Lauren though. The agent Mike is replacing was her partner. Dale “DJ” Jakes the U.S. Customs agent also takes offence when Mike drinks his orange juice. Mike tries to turn things around when he meets the famous Paul Briggs. A man that is supposed to be his mentor but appears to dismiss Mike. Mike is just not making good first impressions. When he meets Catherine “Charlie” DeMarco; he mistakes her for a burglar and pulls a gun. Thereby breaking house rules of no guns downstairs. Lauren calls her former partner to him about the new guy and she tries to assure him that he’ll be back but he’s not sounding so confident. Mike, Paul, and Johnny go surfing. Mike doesn’t understand how this is part of training and its not. It’s just for the guys to have fun. Mike takes a break from it and goes to sit on the beach. Charlie finds him and they get to talking. Mike was expecting something more from his mentor. Charlie explains that something happened to Paul about three years ago. No one knows what but before it Paul was button up guy. Lauren talks Paul into setting up a drug deal with a guy she believes set up her partner. Paul does and figures this is the time to test out the new guy. After a quick prep , Mike goes in. He stumbles but eventually makes a deal. Drugs for a trunk of knock off jeans. Too bad some cops walked the perp right into Mike afterwards. Now Mike has been tagged as a Fed. Someone, a mysterious “lawyer” comes to bail out the Perp. The lawyer was sent by the people the perp worked for. They have the guy’s family. So the guy tells the lawyer it was his brother-in-law. Mike, after being nicknamed “Levi” by his fellow agents, is brought back into the fold. He’s to play the brother-in-law. The people that has Felix’s family will want him to prove himself. Mike might have to kill someone. Learning a new identity in a matter of minutes he sets out to be “Frankie”. A heavy drug user married to Felix’s sister-in-law. The lawyer picks him up and takes “Frankie” to the Russian leaders. In order to prove himself, Frankie lets the leader know he’s killed someone before and is not afraid to do it now. When this gets validated thanks to his friends, Mike is sent out to kill the agent he replaced, Donnie. The two guys stage events however when Mike returns to the car; something isn’t right. Paul shows up in time and kill the guys that were monitoring Mike. There’s just one problem. The second guy never pulled a gun when Paul shot him. Mike covers it up. Both on the scene and later when he’s questioned which might make things difficult later. Everyone is celebrating the bust when Mike gets a call from his boss. Mike is told his real investigation is to investigate Paul.